In 1957 (for a few of the higher command flags in 1959), the present command flags [were adopted] (...). Most of this data comes from Jürgen Rimann's paper at the 15th International Congress. This is a square version of the state and war flag with [a black-red-gold lacework border and] a black-red-gold fringe. Adopted 1964. Used as flag for larger units of the Federal Army (Heer). It is used by the German armed forces in much the same way that the fringed US flag is used by our armed forces, i.e. as a color for parades, ceremonies, etc. I have seen this flag on the news during coverage of state visits to Germany by US presidents; it is carried by the honor guard of the Wachbataillon [Guard Battalion], the ceremonial unit of the Bundeswehr. The German Truppenfahne is a square black-red-gold horizontal tricolor with the national shield overall in the center. The flag is surrounded by a black, red, and gold lacework border and edged on three sides by gold fringe. The finial is a gilt bronze openwork spearhead surrounding a black and silver Iron Cross. Below the finial, a streamer is attached with the unit badge at the top and its designation embroidered in gold at the end. These streamers are red for army (Heer) units, blue for the navy (Marine), and white for the air force (Luftwaffe). The streamer is the same length as the hoist of the flag. German local governments (states, municipalities) perhaps also the Federal government present streamers as signs of friendship and appreciation to military units which have rendered Dienst für Volk und Staat ["service to the people and state"]. After World War Two the Federal Republic of Germany bent over backwards to denazify, and they may have imitated United States streamers, at least in shape if not in concept. The concept of tying communities and military units in friendship was a major pendulum swing from Germany's past. I am more familiar with the British Army experience in Germany. Cavalry and infantry are the only units to carry consecrated Colours/Guidons, and German streamers cannot be attached to these. But these units pass through their German stations too fast to earn them. Engineer and Signal units on the other hand carry informal flags and some units have been stationed in Germany for 50 years or more. When they leave a town, that municipality routinely presents a Fahnenband as a token of the bond that has grown over the years. Truppenfahne: Staatliches Symbol, gestiftet vom Bundespräsidenten als äußeres Zeichen gemeinsamer Pflichterfüllung im Dienst für Volk und Staat. Sie wird an Bataillone und entsprechende Verbände sowie an Schulen der Streitkräfte verliehen. Die erste Verleihung erfolgte am 07.01.1965 an das Wachbataillon. Die Übergabe und Übernahme der [Truppenfahne] mit Fahnenband sowie die Verleihung zusätzlicher Fahnenbänder und das Mitführen der [Truppenfahne] bei besonderen feierlichen Anlässen sind Bestandteil militärischer Formen und Teile der Traditionspflege der Bundeswehr. Die [Truppenfahne] ist die Bundesdienstflagge im Format 100 x 100 cm aus schwerem Seidenstoff und gesticktem Bundesadler, eingefaßt mit schwarz-rot-goldener Kordel und goldenen Fransen. Der Metallring am Fahnenstock trägt die Bezeichnung des Truppenteils. Die Spitze des Fahnenstocks ist ausgebildet als ovaler Eichenlaubkranz mit einem Eisernen Kreuz in der Mitte. Am Fahnenstock ist ein Fahnenband mit der Bezeichnung des Truppenteils angebracht. The troop flag is the federal service flag in 100 cm x 100 cm format made of strong silk with an embroidered federal eagle, surrounded with black-red-gold cord and golden fringe. The metal ring on the flagstaff carries the designation of the unit. The peak of the staff is topped with an oval wreath of oak leaves with an Iron Cross in the middle. On the flag staff is a streamer with the designation of the unit on it. This is the federal service flag in a square form (100 × 100 cm); the shield is in the centre of the flag. Around the free edges there is a black-red-gold cord and a fringe. This flag is the colour that every batallion or batallion-sized unit has. It was legally prescribed on 18th September 1964 in the Anordnung über die Stiftung der Truppenfahnen für die Bundeswehr (Instruction on the Donation of Colours for the Federal Armed Forces), published in the Bundesgesetzblatt I 1964, p. 817. Source: Schurdel 1985. 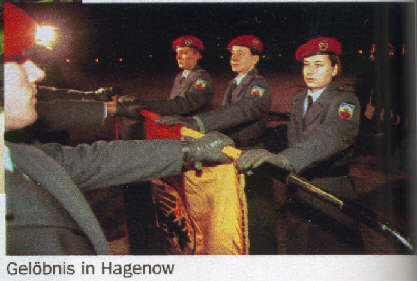 Issue 10 (5th March 2001) of the German weekly news magazine Der Spiegel, p. 52, showed this picture of the swearing-in of some of the new female Bundeswehr recruits with hands on the troop colour. A square flag divided vertically and horizontally into four square fields: first and fourth black, second and third gold, at the center the national arms as in the state flag with a red border around all four sides about 10% the width of flag. The officer who flies this flag is actually the chief of staff of the armed forces. The title Inspector-General is used because of the sensitive historical associations of the terms Chief of Staff and General Staff. The flag, however, employs the same basic checkerboard design, albeit in different colors, that was used in the past by German general officers. Similar to the flag of the Armed Forces Chief of Staff but with wide border about 1/4 of width. Inspekteur (Inspector): chief of any one of the three services  Army, Navy or Air Force. Square flag, quarterly black and gold with the same shield and eagle as on the state flag, with a wide red border measuring 1/4 of the hoist. Source: Schnell and Seidel 1983. Also shown in Album des Pavillons 2000 labelled as Inspector of Navy.